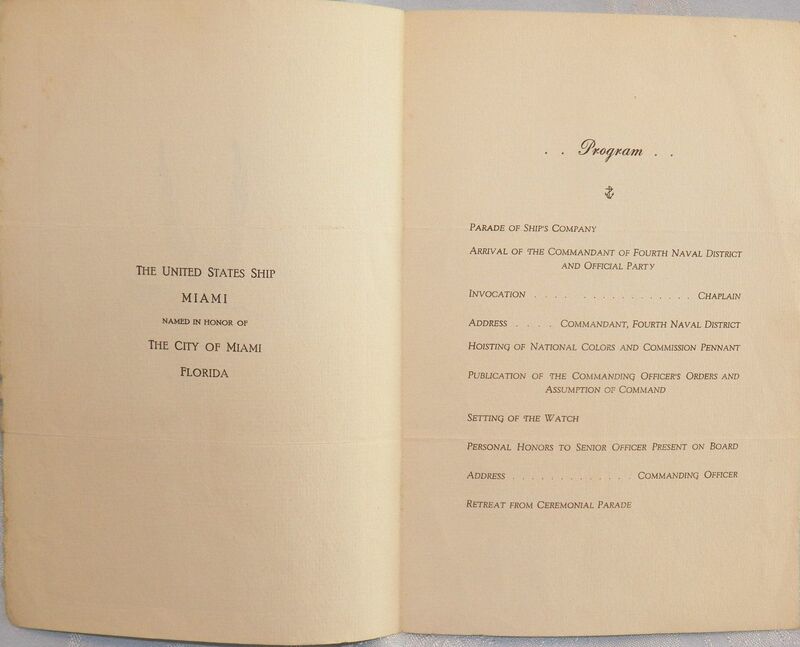 Fate: Sold for scrap on 20 JUL 1962 to Nicolai Joffe Corp., Beverly Hills, CA. 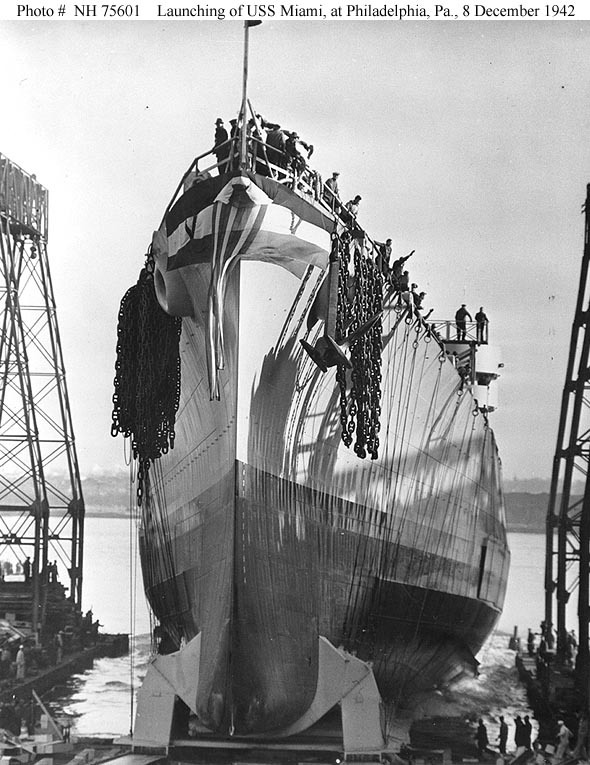 USS Miami (CL 89) Launching, at the Cramp Shipbuilding Company, Philadelphia, Pennsylvania, 8 December 1942. Note anchors and chains hanging near the ship's bow, for use in stopping her once she was afloat. Courtesy of Mr. James Russell, 1972. U.S. Naval Naval Historical Center Photograph #NH 75601. Left of Oklahoma City is Little Rock (CL 92) - Keel was just been laid on 6 March, which is visible under crane structure. 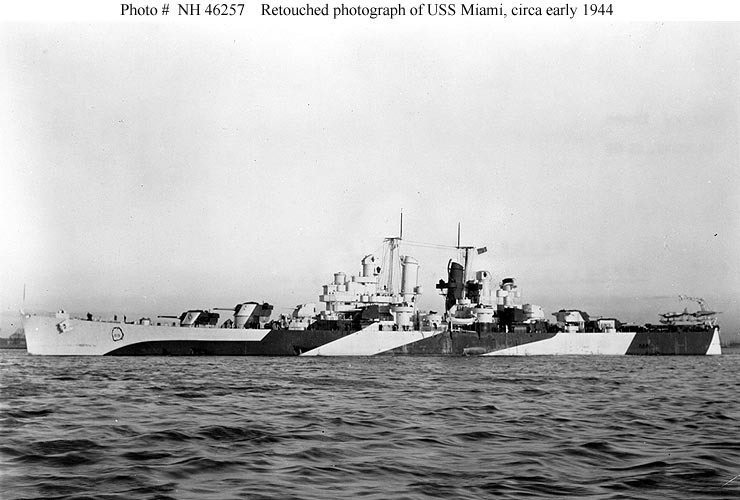 USS Miami (CL 89) Photograph taken circa early 1944, showing the ship painted in camouflage Measure 32, Design 1d. This image was retouched for World War II public release purposes. However, note that while the censor removed the entire forward main battery gun director, the after director and its radar antenna remain completely visible. 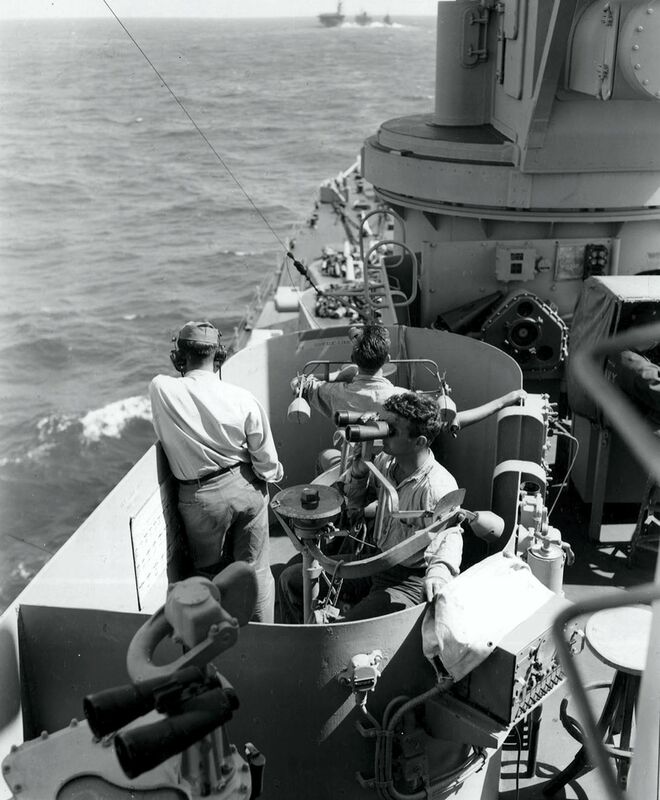 Radar antennas atop the secondary battery gun directors and the masts have also been removed, and the ship's hull number, near her bow, has been circled. Official U.S. Navy Photograph, from the collections of the Naval Historical Center #NH 46257. 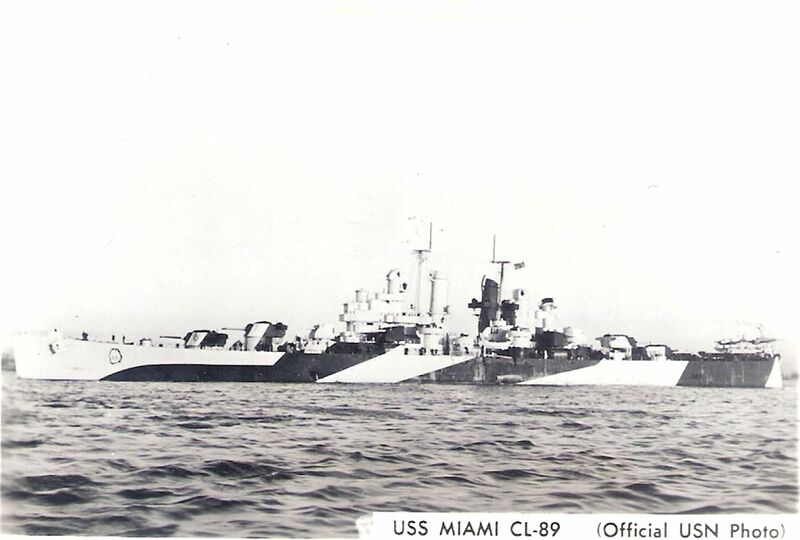 USS Miami (CL 89) Underway at sea, circa early 1944. The ship is painted in camouflage Measure 32, Design 1d. Official U.S. Navy Photograph, from the collections of the Naval Historical Center #NH 98403. 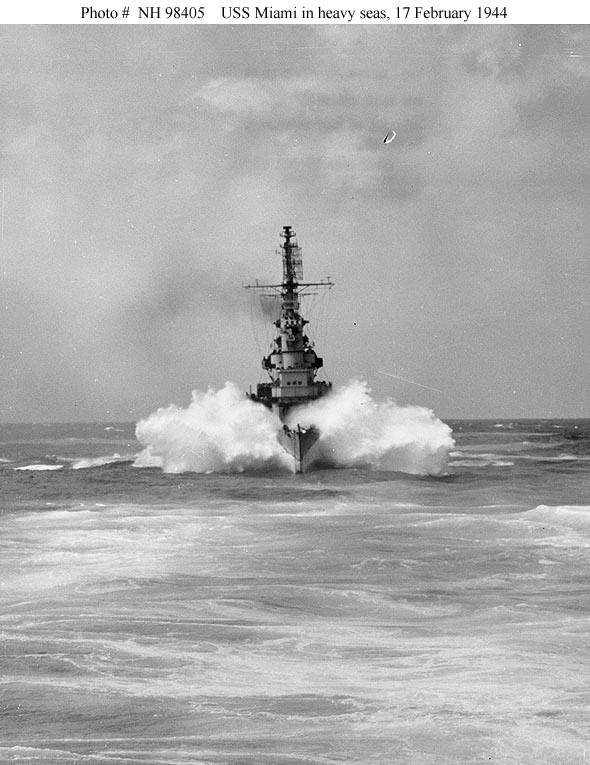 USS Miami (CL 89) Steaming in heavy seas during her shakedown cruise, 17 February 1944. Photographed from USS Quincy (CA 71). Official U.S. Navy Photograph, from the collections of the Naval Historical Center #NH 98405. 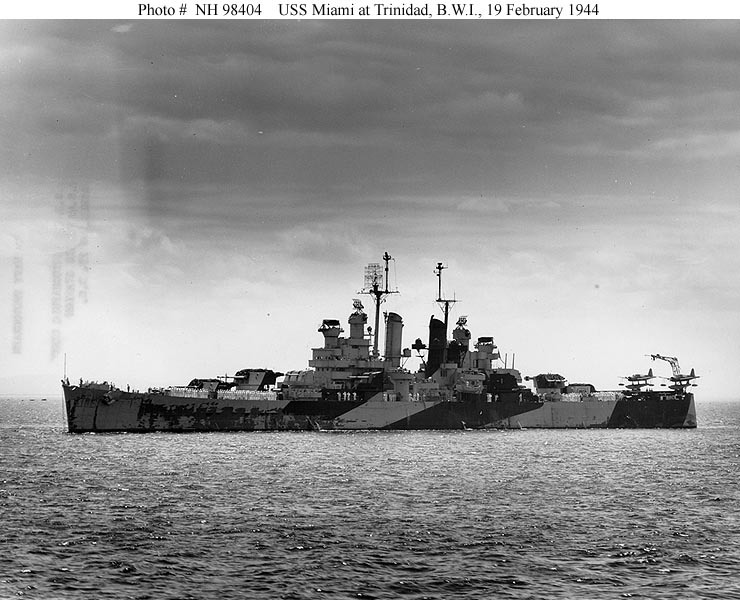 USS Miami (CL 89) At Trinidad, British West Indies, with her crew at quarters on deck, 19 February 1944. Note her Measure 32, Design 1d camouflage, considerably worn away forward by wave action. 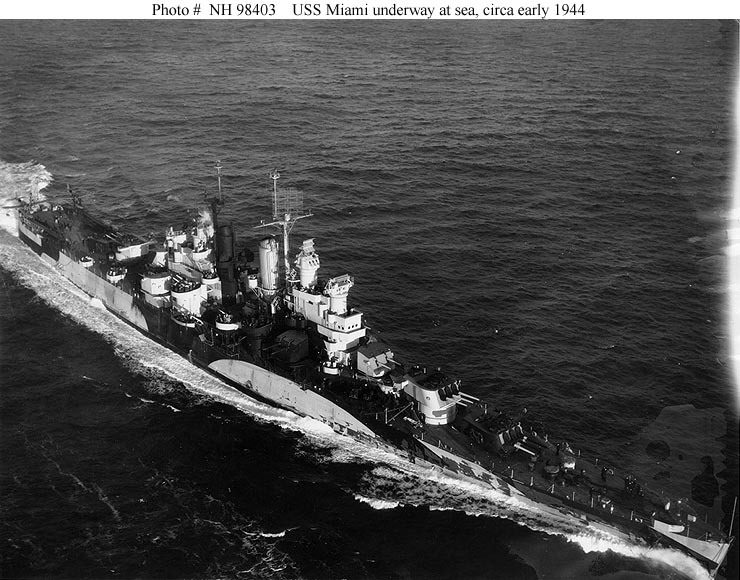 Miami was then on her shakedown cruise. 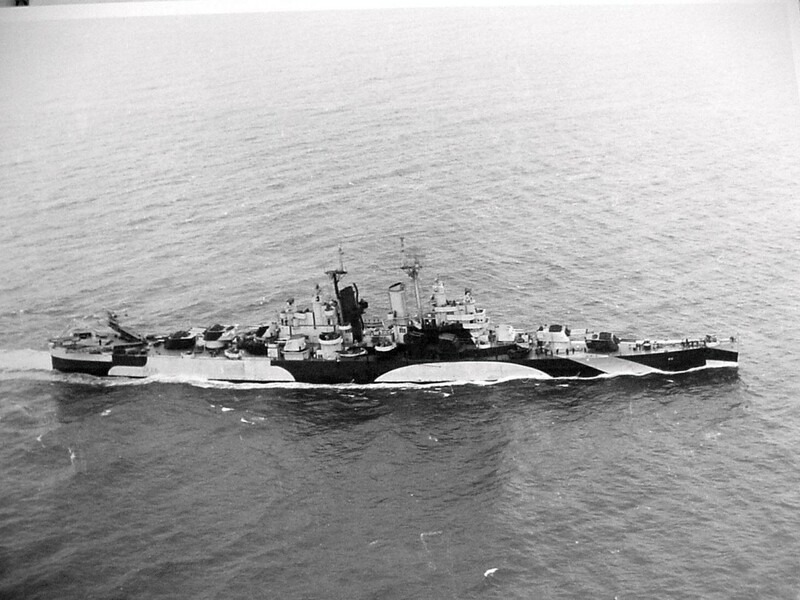 Photographed from USS Quincy (CA 71). Official U.S. Navy Photograph, from the collections of the Naval Historical Center #NH 98404. 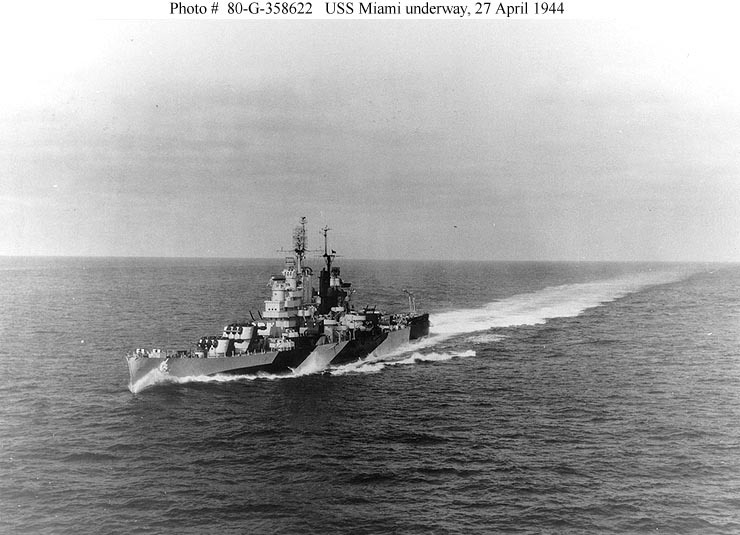 USS Miami (CL 89) Underway at sea, 27 April 1944. 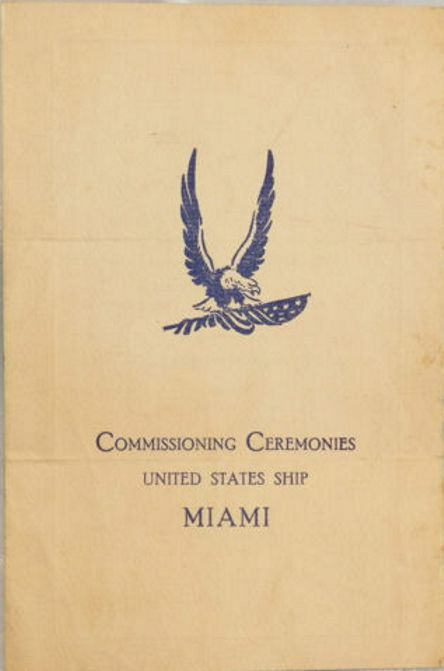 Official U.S. Navy Photograph, now in the collections of the National Archives #80-G-358622. A smoke ring is left by turret #1 as Miami pounds the Palau islands on 7 September 1944. 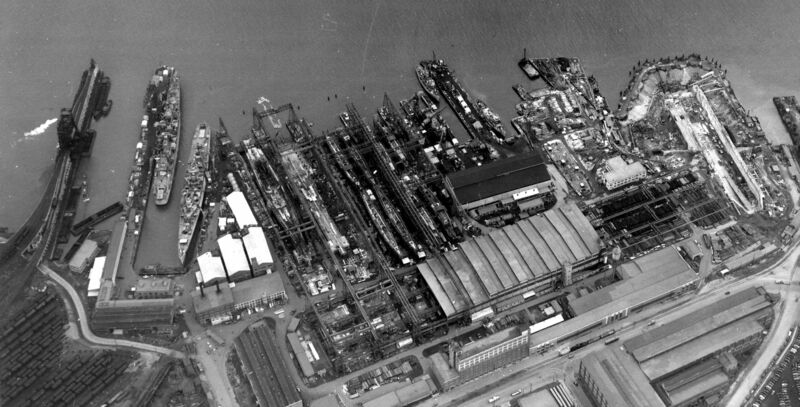 Note that a wartime censor has obliterated the SK and Mk 37s Mk 4 radar. Navy photo #80-G-284070, now in the collection of the US National Archives at College Park, Maryland. 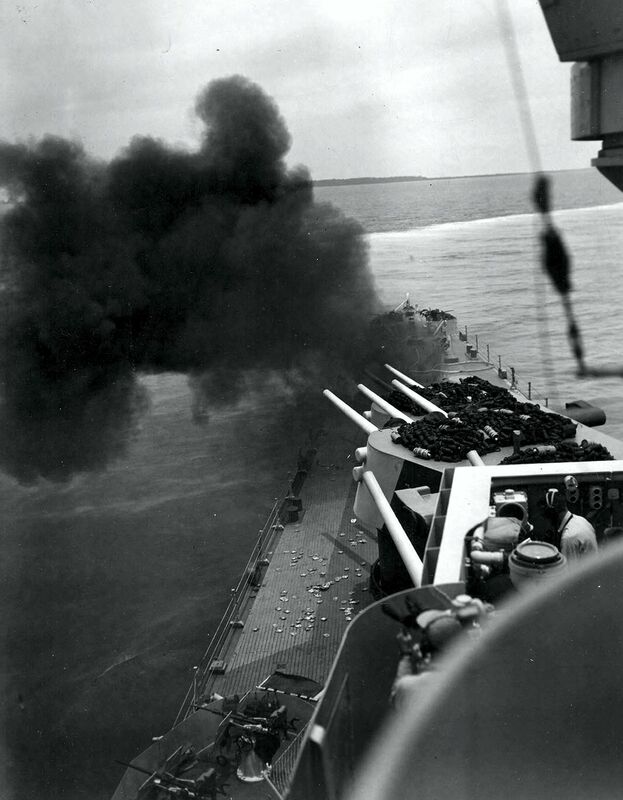 Miami fires on the Palau with her main guns in the wake of another member of CruDiv 14 on 7 September 1944. Navy photo #80-G-284073, now in the collection of the US National Archives at College Park, Maryland. 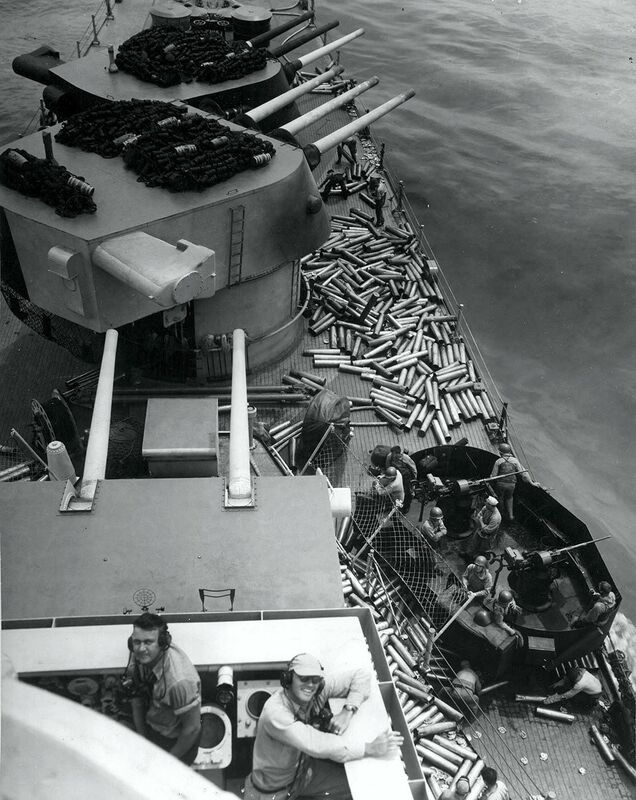 Miami's crew collects empty 6" shell casings after she shelled the Palau Islands on 7 September 1944. 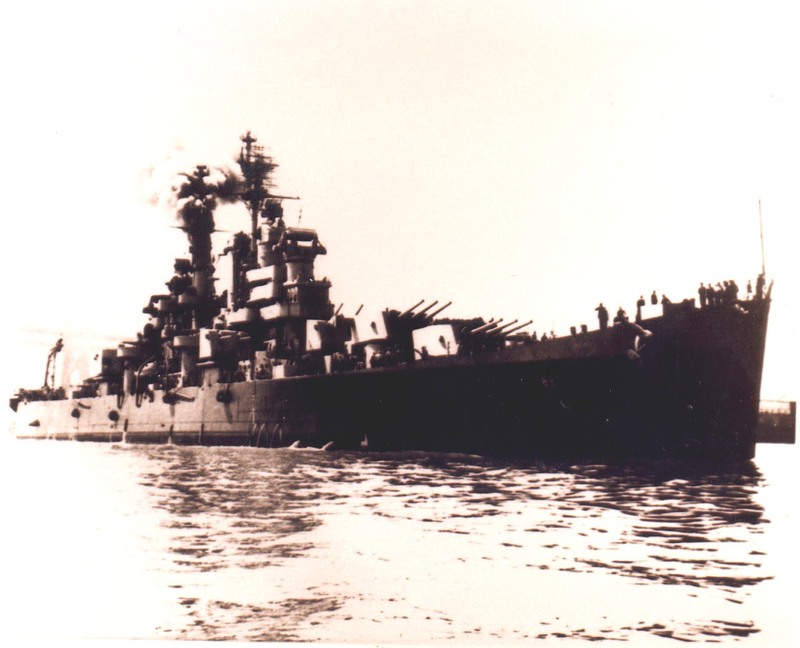 USS Miami (CL 89) Prepares to depart for the invasion of Okinawa, March 1945. 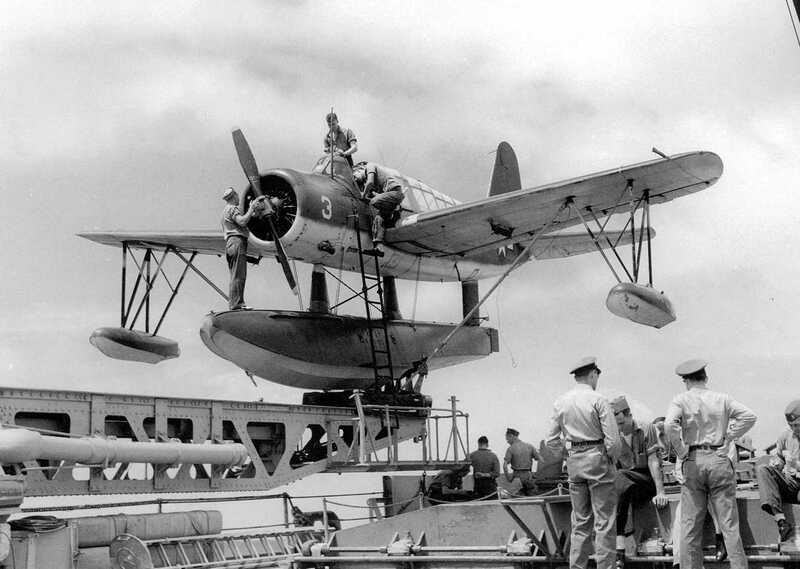 Probably taken at Ulithi Atoll. 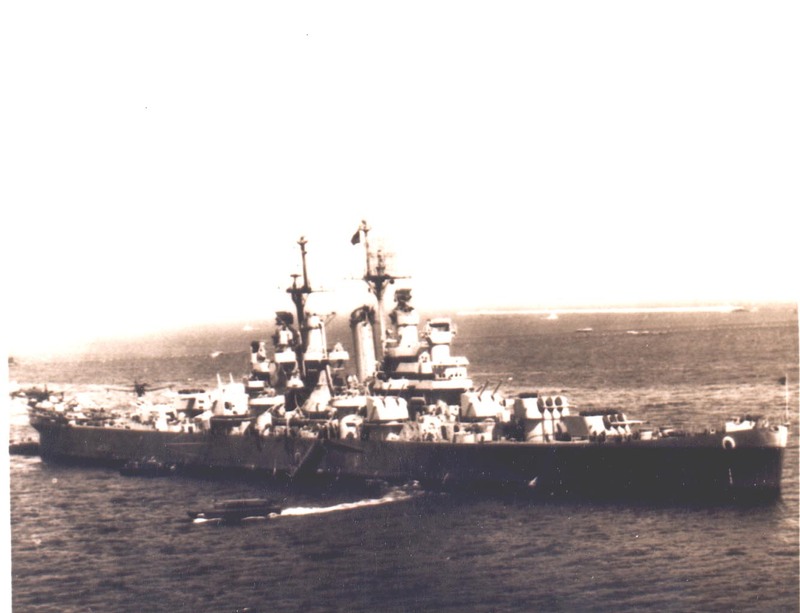 Photographed from USS West Virginia (BB 48). 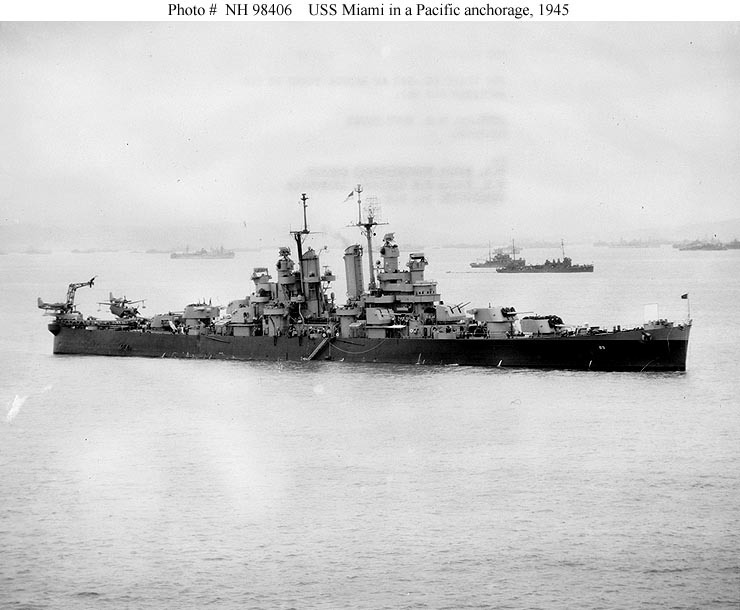 Official U.S. Navy Photograph, now in the collections of the National Archives #80-G-K-3812. 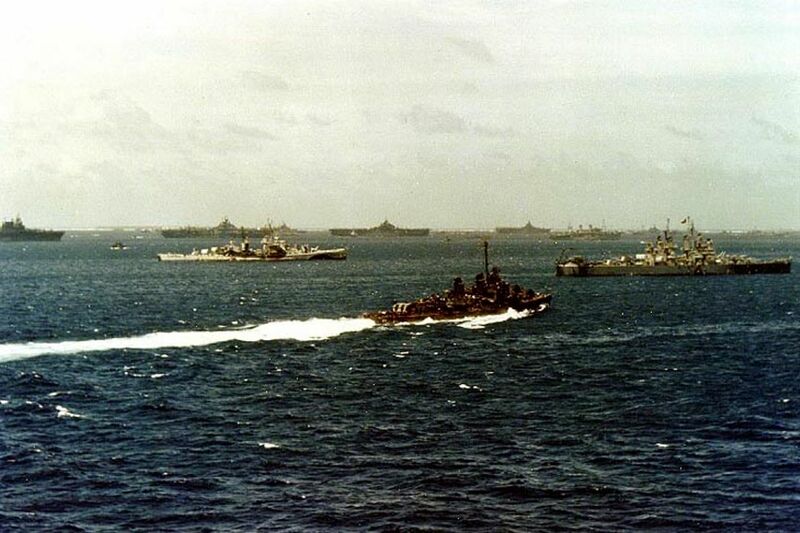 (Low-resolution original that the above photo was cropped from) - U.S. Navy destroyer minelayer USS Shannon (DM 25) steams past task forces gathering at Uithi Atoll for the Okinawa Operation, circa March 1945. 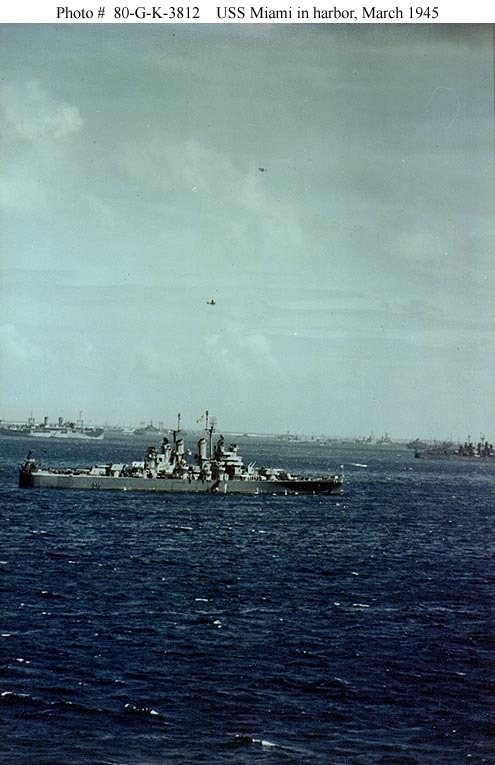 Ships in the near background include USS Flint (CL 97), in left center, and USS Miami (CL 89), at right. Three Essex-class aircraft carriers are anchored in the middle distance. 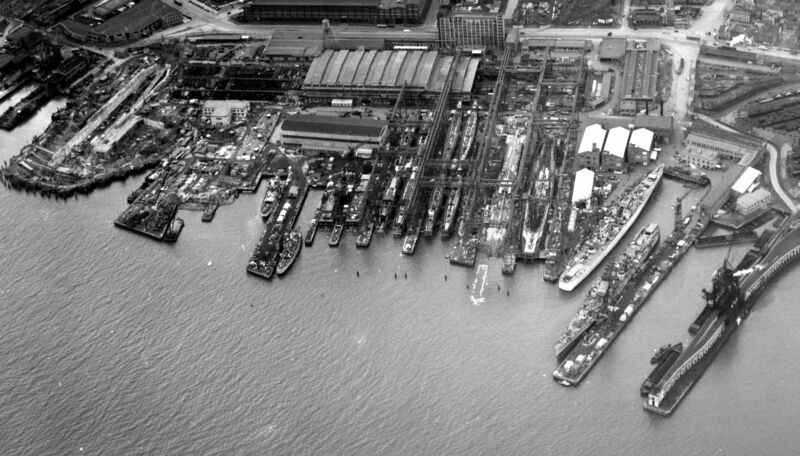 USS Enterprise (CV 6) is at the far left. Forward Air Defense level scans for enemy aircraft as Miami steams behind a carrier and destroyer undergoing underway replenishment, March 1945. US Navy Photo #80-G-313371 now at the National Archives in College Park, Maryland. 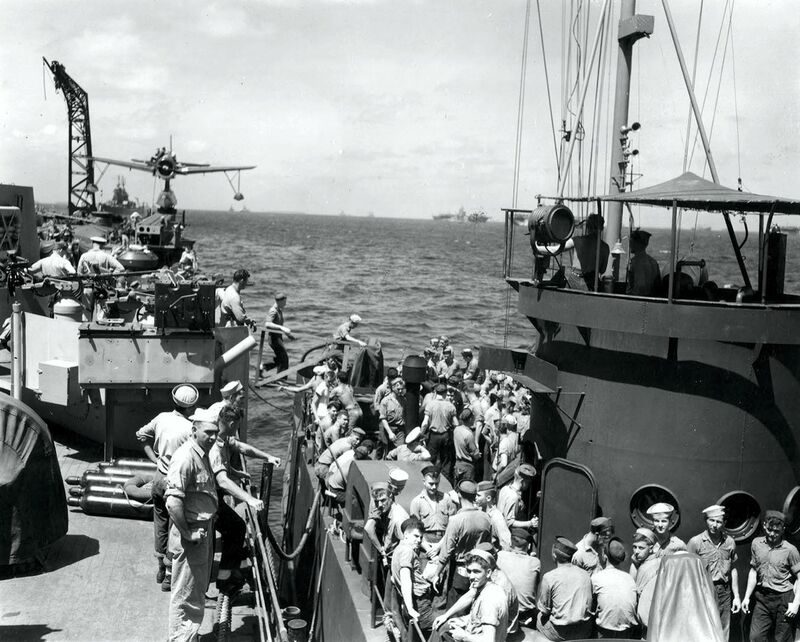 Crew of USS Miami (CL 89) loads on to LCI-681 from Miami's stern for a trip to Mog Mog island at Ulithi for recreation on 10 March 1945. US Navy photo #80-G-313358 now in at the US National Archives in College Park, Maryland. 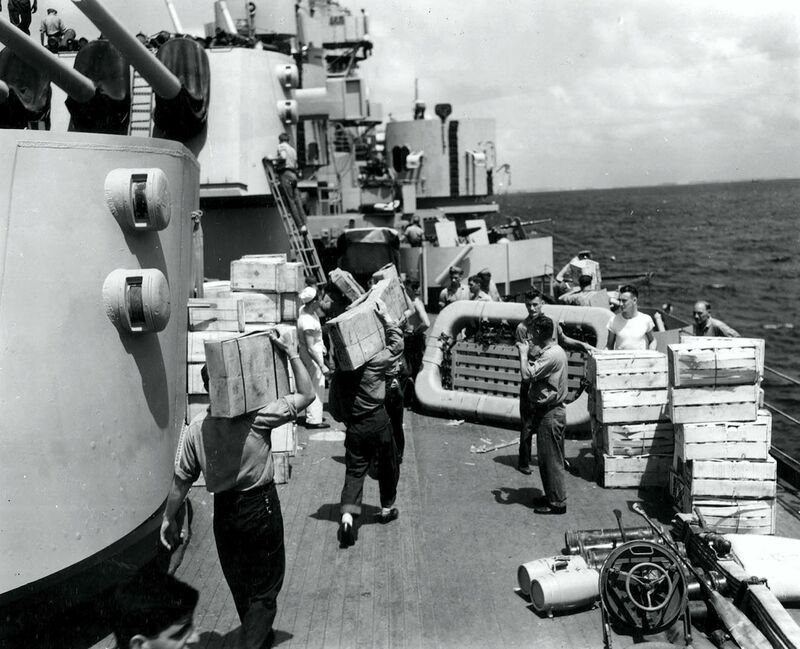 USS Miami (CL 89) crew work to re-provision her on 16 March 1945, before she headed to Okinawa to support operations there. US Navy Photo #80-G-313361 now at the US National Archives in College Park, Maryland. USS Miami (CL 89) Crewmen hoisting in one of the ship's paravanes, during operations in the Pacific Ocean, 26 March 1945. Photographed by R.J. Guttosch. Note sheath knives worn by some of these Sailors. 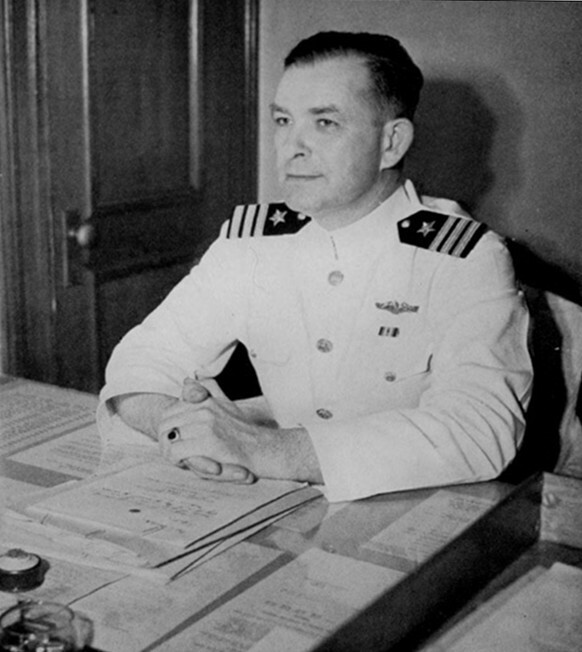 Official U.S. Navy Photograph, now in the collections of the National Archives #80-G-K-4272. 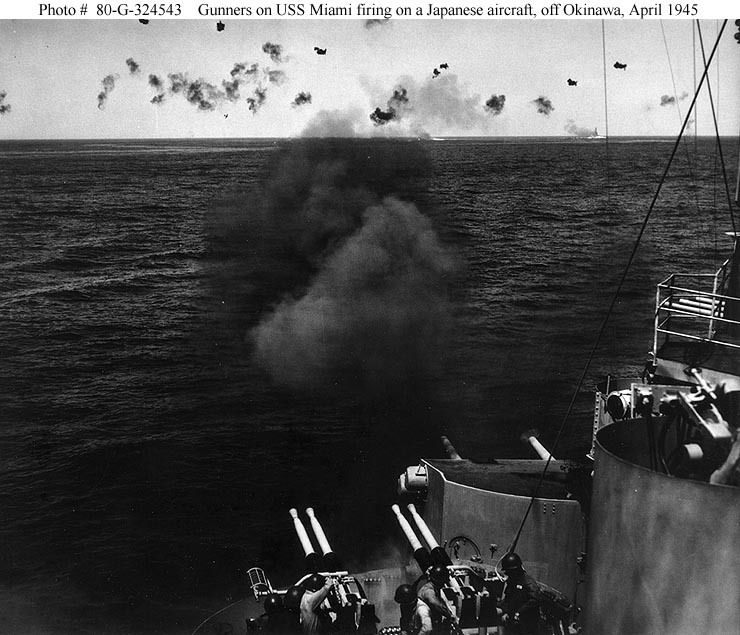 Okinawa Campaign, 1945 - A Japanese airplane ("believed 'Zeke'") about to crash into the sea as a result of heavy anti-aircraft gunfire, during an air attack on Task Group 58.1 off Okinawa, 14 April 1945. 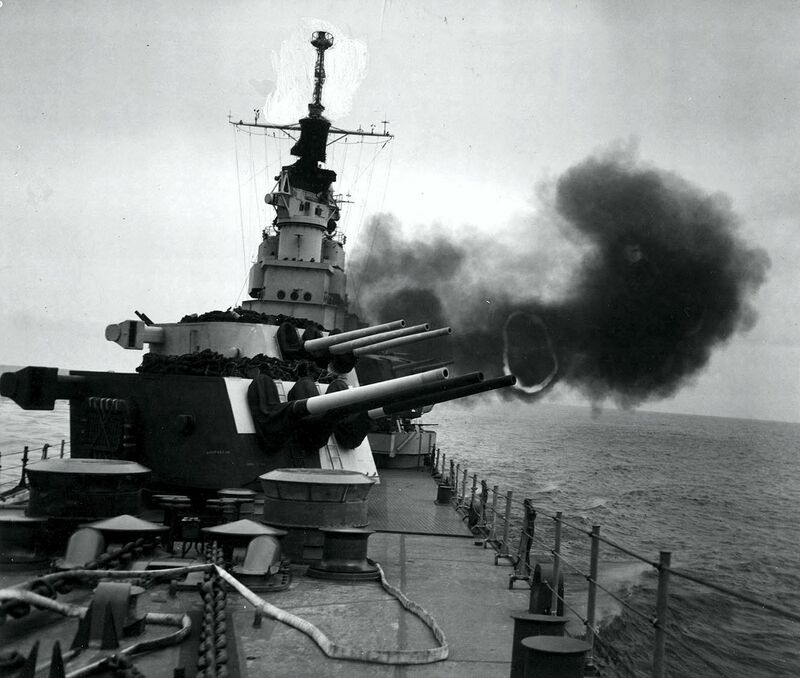 Photographed from USS Miami (CL 89), whose 5"/38 and 40mm guns are firing in the foreground. Two other ships, nearly hidden by gunfire smoke, are in the distance. 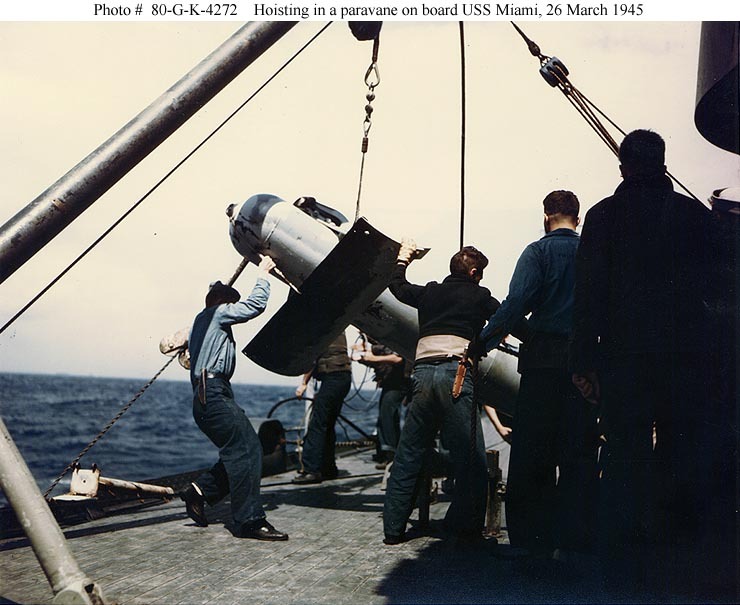 Official U.S. Navy Photograph, now in the collections of the National Archives #80-G-324543. 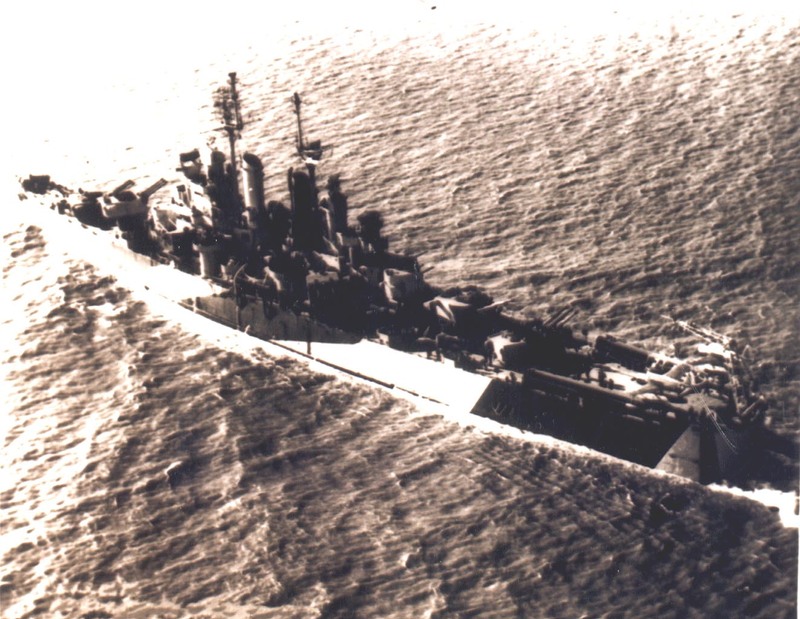 USS Miami (CL 89) In a Pacific Ocean anchorage, soon after the end of the war with Japan, circa September-October 1945. Photographed from USS Antietam (CV 36). Official U.S. Navy Photograph, from the collections of the Naval Historical Center #NH 98406.